Like most entrepreneurs, D.W. Onan was a confident man. He was optimistic that his new business would grow and succeed, and he wasn’t concerned, or even aware, that he was pitifully short of capital for expansion or that he lacked solid business experience. In retrospect, it was fortunate Onan wasn’t the conservative type, because, in all likelihood, he wouldn’t have started his business in the first place. He certainly wouldn’t have made the plunge he did in late 1923 to spend nearly all his available funds to became a property owner. There’s no question that Onan’s growing business needed more space than was available in the old former barn he rented on Oliver Avenue and 14th Avenue North , but the property he bought on Royalston Avenue, near the Minneapolis Loop, far exceeded his immediate needs. In addition to the large, three-story house at 43 Royalston there also was a smaller house behind it on the some lot. Then there was a large, usable barn, a shed and a summer kitchen behind the smaller house. Onan was in an expansive mood when he made the purchase, and he decided that even though he didn’t need the space immediately, he purchased the lots on 45 and 47 Royalston as well. Lot 45 was vacant, but there was an ornate old gingerbread house on Lot 47. Within the next few years, Onan’s foresightedness paid off handsomely. Before 1924 was over, he had connected all the buildings at 43 Royalston into one large complex. Early in 1925 he started building on the adjacent lot, and by 1929 his factory covered all of Lots 43, 45 and 47. It’s interesting that one of the first carpenters Onan hired to expand the buildings on Royalston was Gabe Valenty. It was through this association that Valenty’s son, Tom, became acquainted with Onan and his company. Tom Valenty joined Onan on a part—time basis in 1936 and stayed with the company throughout his career, serving as president and chief executive officer from 1972 until 1981 when he was named vice chairman of the board. Tom Valenty retired in June 1982. While it’s obvious D.W. Onan made a wise decision in buying the Royalston property, it also is obvious he didn’t carefully inspect the buildings before doing so. One of Onan’s two sons, C.W. (Bud) Onan who was 15 at the time, was given the job of cleaning up the building before his father moved in his equipment. When Bud got to the second floor of the big, old house, he noticed a “terrible odor. ” Bootleggers had been using the house and the summer kitchen to make illegal whiskey, and Bud found 32 barrels of overly ripe mash. Bud went across the street to use the phone and called his father. “Have you been in the upstairs of that house?” he asked his Dad. “No,” D.W. Onan answered. “You ought to come over,” Bud recommended. D.W. Onan rushed over to his newly purchased property, saw the mash and called police. Those were prohibition days, but the police were unable to track down the bootleggers. After the house was cleaned, Onan transferred his operations from the old barn to his new location. He was in full production by the first of the year, 1923, but sales of his auto repair equipment were slow during the first several months. Onan was marketing the tools and equipment through small ads in magazines and with direct mail, and although the response was good, his limited capital made it impossible to greatly increase his promotional activities. The product line was the same he had been assembling first from the basement in his home and then in the converted barn. His one new item after moving into the Royalston location was a test bench that was designed to hold all the equipment Onan sold. The test bench was made of angle iron with a four-by-six-foot hardwood top on it. The one-and-one-fourth-inch top was made of birch or maple. The bench had a drawer to hold the Onan Wrist Meter and instruction book and some of the other small tools. The test equipment could be mounted on the bench. When a customer bought a piece of equipment from Onan, it normally was shipped in a wood crate. Cardboard cartons were not popular in those days. Each shipment needed a different sized crate, depending on what was shipped, and there was no supplier of custom-made crates. So Onan’s workers hand-made each crate. Shipping the test bench, because of its size and weight, was especially a costly and time-consuming chore. It took two workers most of one day to build a crate and ship the test bench. A work day back in 1923 was vastly different from today. Onan’s workers, and most other craftsmen in those days, worked from 7:30a.m. to 5 p.m. on Monday through Friday and even longer, from 7 a.m. to 6 p.m., on Saturdays. Onan, who was constantly seeking ways to improve productivity, was frustrated over the time it took to crate his tools and equipment. He finally decided that because the big consumer of time was sawing the wood that went into the crates, he would buy a motorized saw so he could speed up the process. After several days of looking around the Twin Cities for a proper motor-driven saw, he gave up. The only thing he found suitable was a large overhead swing saw, and he decided that was simply too dangerous. Onan was never frightened by the prospect of trying to invent a work saver, or a piece of equipment that could save him money so, as he had done time after time when he couldn’t find equipment he wanted, he decided to design a saw himself. For instance, when Onan first moved into the house at Royalston, it was heated by an old coal furnace that was constantly giving him trouble. It didn’t dawn on him to buy a new furnace. He called his old friend, Ralph Hitchcock, and the two of them designed an oil burner to convert the coal furnace. This was before oil furnaces were available. Onan and Hitchcock made a brass unit which was set inside the furnace. Oil dripped on it from above to create a flame. Dyke Grabow, Onan’s office manager, whose job every day was to buy two quarts of kerosene in the morning to feed the burner, said he thinks it was ‘the first successful oil furnace ever made. For some reason Onan decided not to market the oil burner, and it was one of his few inventions he didn’t later sell on the open market. The saw he invented, for example, proved to be one of his most successful products. Onan’s main concern in designing a motor-driven saw was to make one that was safe to operate as well as saving time and money. His first saw consisted of channel iron welded together for the stand and a flat piece of metal for the top. The top was bent down two inches on all four sides and the corners were then welded. In the top was a long saw slot with various holes along it in different positions. The saw guides were made with two metal bars riveted together. The saw was operated by a swing saw beam bolted to the side cross beams. The electric motor was mounted on a plate fastened to the saw beam so the weight of the motor counter-balanced the beam. The saw handle was operated with the right hand leaving the left hand free to hold the board to be cut. The board was held firmly against the guide and the saw blade was pulled across the board. With both hands being used to operate the saw, it made the operation relatively safe. Although Onan made many improvements in future years, the original design of the saw was an immediate success. It was a revolutionary approach to motor driven saws, and it opened an immense market. Not until the radial saw was invented years later was there significant improvement in the design of Onan’s saw. The major difference between the radial saw, which is commonly used today, and Onan’s saw is that the blade is mounted on top in the radial saw, while Onan’s design had the saw blade underneath. Onan’s saw was designed primarily for cross-cutting boards to make his crates, but it could be converted easily to do heavy ripping, mitering and even had a removable dado throat. The dimension of the top of Onan’s saw was 26 inches wide and 32 inches long. Side tables, made of wood encased in a steel band, would be attached, forming an eight-foot-long bench. 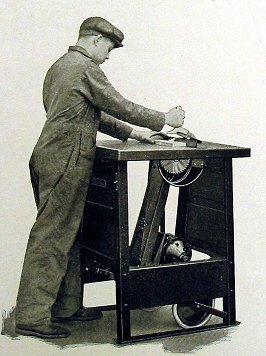 There were wheels on the bottom of the stand so the saw could be easily moved even though it weighed nearly 400 pounds. The aluminum handle, which was used to pull the saw blade forward, also served as a guard to protect the blade when not in use. The guard and gauge on top of the table were adjustable and served as an enclosure in which the saw blade operated. Saw blades were 12 inches in diameter and made of 15 gauge steel. The first electric motors were two horsepower, powerful enough for any work which the saw blade could handle. Operation of the saw was as simple as marking a board with a pencil, and the sawing speed was as fast as an operator could draw the blade forward. The main safety feature of the saw was that the operator had to stand erect to run the saw and both hands had to be used, one for holding the lumber and the other for pulling the handle forward. The electric motor was spring mounted, causing the belt to slip if the lumber was pinched or caught. The saw enabled Onan’s workers to reduce drastically the time necessary to build a crate to ship the auto repair tools, but the unexpected bonus was that it became the young company’s most popular product in the marketplace. Onan decided to market the saw soon after the first model was built and he could see the potential. Because the safety features were impressive, Onan decided to incorporate that in the brand name. He wrote out the first piece of advertising material in longhand, and gave it to Dyke Grabow to type. Grabow noticed that Onan had called it the “Safty Saw,” and Grabow mentioned to Onan that he had misspelled “Safety.” Onan replied, “Leave it just that way, because then we can have a copyrighted name that no one can steal. So, from then on, the Onan saw was officially named the “Safty Saw”, and despite the spelling error it was marketed that way throughout the country, and no on attempted to copy it. After making his first saw for his own shop, Onan was asked by his friend and investor, Oscar Dahlen, to build one for his printing business. The third saw was sold for Onan by Reuben Skarnes to a company in Duluth. Skarnes, a long-time friend of Onan, played an important role in marketing the saw even though he never was a full-time employee of the company. Skarnes knew D.W. Onan when Onan was working for the Reinhard Company, and they became close friends. Skarnes, like Onan, was mechanically inclined so they had much in common. Skarnes left Minneapolis before Onan started his business. He took a job as a sales engineer for the Hyatt Roller Bearing Co. in Chicago and worked there until 1923 when his father, back in Minneapolis, suffered a stroke. Skarnes returned to the Twin Cities to be with his father and gave up his job with Hyatt. When Onan was with Reinhard, he often talked with Skarnes about his dream of going into business for himself. He convinced Skarnes that the independence of being your own boss was worth just about any sacrifice, When Skarnes returned to Minneapolis, Onan was operating his own business, and he offered Skarnes a job. The first sale, to the company in Duluth, netted Skarnes $9.90 in commission. “Dave had priced the saw too low at the beginning,” Skarnes said. The first models went for only $105, Skarnes remembers, but Onan quickly increased the price as the sales demand exceeded his ability to produce them. As the price increased, however, the saw also was improved. There were blades and equipment added to it so it could cut marble and tile. The biggest improvement came when Onan decided to have a die for the top produced by the Youngstown Press Steel Co. in Ohio. The top and the ends were then stamped out, giving the saw a much more professional look. The disadvantage was that Onan had to order 1,000 tops at a time from Youngstown without having saw orders to fill. Fortunately, orders for the saw came in from all over the country, and the item soon exceeded revenues from all other Onan products. Skarnes remembers traveling to cities like Chicago and San Francisco, selling dozens of the saws on a trip. He also established dealerships in many different cities. He recalls large trucks with crated saws piled two deep leaving the Onan plant at least twice a week. The market for the saw was greatly expanded when Onan decided to offer it with an air-cooled gasoline engine so it could be used outside at construction sites. The saw now was available with a Briggs & Stratton gasoline engine or two types of electric motors— a three-phased 220-volt motor or a single-phase motor for either 110 or 220 volts. A big boost came in 1925 when the A. S. Aloe Co. of St. Louis, a general contractor, asked Onan to manufacture saws with the Aloe brand on them for outside construction work. By now the saws were priced at between $250 to $275, depending on the motor available. In 1925, Aloe alone purchased $12,510 worth of saws and the following three years bought about $25,000 worth each year. Sales to Aloe fell off in 1929, and the company stopped buying the saws in 1930. Onan continued to market the saws to others, however, until just before World War II. The saw was the salvation of the Onan company during the 1920s, and sales far exceeded the volume coming from the auto tools. The peak year for the saw was in 1926 when sales of this one item reached $192,572, while sales of all of Onan’s automotive products were only $27,314. Sales of the automotive tools and equipment really never took off for the Onan Company, partly due to the success of the saw. The peak year for Onan’s automotive line was in 1925 when sales were $29,871. The volume went down each year thereafter until the line was dropped in the 1930s. Saw sales, on the other hand, remained healthy until the effects of the Great Depression were starting to be felt in 1930. Here are the annual sales volume of the saw from the time it was first marketed in 1924 until it became a minor part of the business in 1933. Because saw sales remained robust for many years, Onan never had problems with ordering the stamped-out tops from the Youngstown Press Steel Co. in quantities of 1,000. Problems did arrive, however, in the 1930s when sales began to fall off. Most of the last order of 1,000 tops remained at the Youngstown plant for years until company officials told Onan he would have to have them all shipped to Minneapolis, Onan old-timers remember seeing hundreds of the tops stored in a Minneapolis warehouse long after the saw had been discontinued. Other, even more successful, products followed the “Safty Saw,” but there’s little doubt-that if Dave Onan hadn’t invented the saw in 1924 and decided to market it, the Onan Company might never have succeeded. The “Safty Saw” played a mighty important role in the history of the Onan Company. Posted in Blog, Company History.